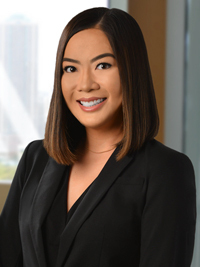 Goodsill has added Joelle B. Yamamoto (JD ’15) to the Trusts, Estates and Family Business practice group. Joelle joins the firm as an associate and will concentrate her practice in the areas related to estate planning, probate and trust administration, including will and trust disputes. She is a graduate of UH Mānoa’s William S. Richardson School of Law and has clerked for the Honorable Derrick H. M. Chan during his term as Chief Judge of the First Circuit Court and his subsequent term as Associate Judge of the Intermediate Court of Appeals. Goodsill Anderson Quinn & Stifel LLP, founded in Hawaiʻi in 1878, has over 50 attorneys representing local, national and international clients. Goodsill lawyers handle a wide range of business and legal matters, extending personalized legal services with cutting-edge resources. For more information about the firm, please visit: www.goodsill.com.